We, the people of the theatre, are generally regarded as a most superstitious set of folks. Friday the 13th is not generally regarded as a fortuitous date to those of the superstitious sort. When I decided to pick Friday the 13th of April as the opening night for Into the Woods, I didn’t need a fortune teller to tell me the odds were stacked against us having a smooth and successful premiere. The end of the third marking period, the week after returning from spring break, the potential for more weather cancellations, and the juggling act of two casts both getting sufficient opportunities to feel confident going into opening night all combined to ominously stack the deck. And yet, in this business, the seed has already been planted when we signed the contract. The show will open whether we’re ready or not on the predetermined date. As fortune would have it, the cards were in our favor. Opening night was the first time we ran through the show without any interruptions. We can largely attribute that fact to our tireless dedication to quality. Right until the very final hours leading up to the premiere we made changes and corrections. We still do. This is not nitpicking. It’s a refusal to take our eyes off of what matters most: our students learning the most from this experience and not letting quality drop just because we’re short on time. I firmly believe the extended rehearsal process we’ve had has allowed us to make last-minute adjustments without overwhelming our actors, technical crew, or musicians. This is not to say that tensions didn’t run high. There were a few moments where some of our more negative tendencies started to show as a feeling of uncertainty rose through the ensemble. I’d like to think this reflects more on my inexperience as a director, the difficulty of the material, and just the nature of performing arts than on any individuals. That being said, it got a little ugly toward the end of our final rehearsals and it took quite a bit of faith and trust in the process to carry us over the finish line. When the lights went up, and our Narrator proudly proclaimed, “Once upon a time,” I knew we were ready to put on an amazing show, and we sure did. For every tremendous opening night, there’s a second night slump just waiting around the corner. In the theatre, as mentioned above, we’re a superstitious folk. When the stars aligned like they did on opening night, it was my natural tendency to wonder if the cast and crew might relax a little too much and rest on the victory. Instead, on Saturday night they proved themselves both technically precise, and hungry to prove themselves all over again to a new audience. I hope that through backing up their great opening night with a rock-solid Saturday show, these kids learned that some superstitions are meant to slain. Sunday also marked the first of our two pre-show “Magical Walk Through the Woods” with our younger audiences (ages 3-7). These guided tours backstage and interactive activities were designed with multiple educational outcomes in mind. 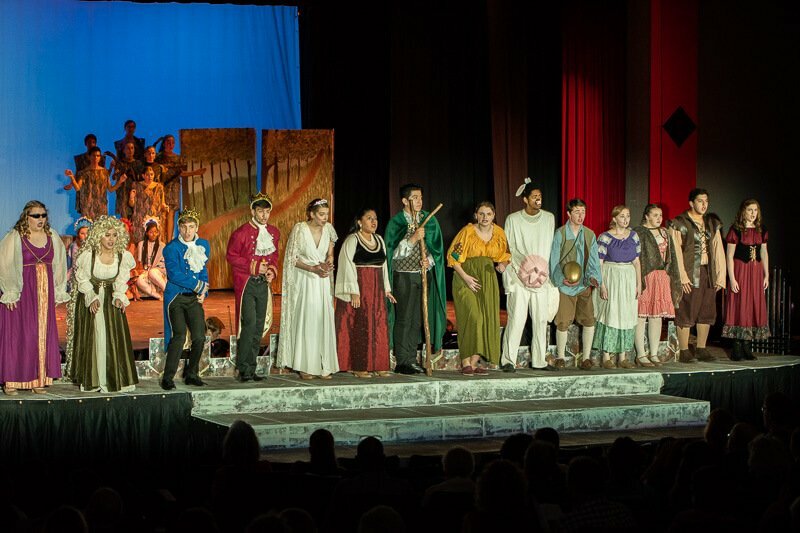 First, we wanted to familiarize our youngest audiences with the themes and characters of Into the Woods that might help them follow more of what is a very interwoven and complicated (albeit brilliant) plot. Second, we want to allow our actors to experience a more immersive and intimate type of performance. This kind of applied theatre gets people to think about their roles in a much more life-like and improvisational fashion which can then inform their mainstage work even further. Lastly, and most importantly, we want to create an environment where families can find themselves lost in a world of theatre with moments of magic and wonder. This environment can lead young minds to start thinking about theatre as a thing they can do and experience and not just passively watch. So I took a risk and gave those Freshmen more than they would get under the old system, but still made sure to balance the future of my program with the present crop of exceptional performers who are about to graduate. The risk paid off immediately by the kids giving a memorable performance on both sides of intermission. But I believe the risk will pay off tenfold as a long-term investment in developing performance skills in students who would normally have to “wait in line” but are clearly ready to claim the stage now. By the time this group of Freshmen and Sophomores are Juniors and Seniors, we’ll be doing college-level work. Just stick around and you’ll see. I cannot wait to see this production when I come from upstate New York next weekend.! !